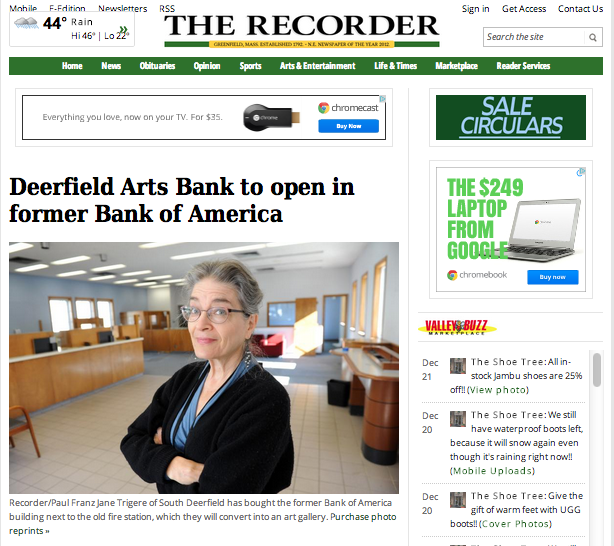 SOUTH DEERFIELD — Rather than being a venue for cashing checks and signing loans, the former Bank of America building will become a place to exchange and show art. Jane Trigere and Ken Schoen of South Deerfield purchased the Sugarloaf Street bank building and closed on the deal this month. The main entrance of the bank will be transformed into an art gallery, displaying changing exhibits from local and national artists. The bankers’ exchange area will morph into an arts supply store, the bank manager’s office will become an art classroom and the ATM room will turn into an installation art room, called the ATM installation gallery.